As always, Clare finds herself in some kooky situations while investigating the death of her dear friend Alf, including moonlighting as Santa's sexiest "little helper" at a VIP party. 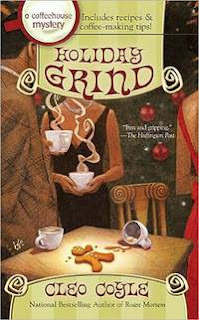 From a plot standpoint, Holiday Grind is probably my least favorite novel in Coyle's Coffeehouse series to date. I wasn't quite invested in finding out who killed Alf and why, mostly because I felt detached from the entire story and all the characters. The novel had a promising start with Coyle providing us explicit bios on Clare's coffeehouse staff, but perhaps the holiday theme overshadowed the plot itself, especially since new holiday drinks and recipes were abundant in this one. The Clare-Matt-Mike love-triangle continues to sizzle and entertain - the dynamic between Clare and her two men could very well be more interesting than the mysteries themselves at this point in the series! My other favorite scenes in the Coffeehouse series are those that take place from within the Village Blend, which I admit is one of the more colorful settings I've been able to fabricate in my imagination thanks to Coyle's amazing talent as a writer. With my mass paperback copy of this novel sitting at a thick 367 pages, I was disappointed when I reached the epilogue to Holiday Grind unexpectedly early on page 279. However, those of you into coffee knowledge, trivia, and holiday recipes will absolutely love Coyle's bonus section at the end of the book, which instructs readers on how to make the perfect "Fa-la-la-la-latte," among other things. The books that follow Holiday Grind in this Coffeehouse series are Roast Mortem, Murder by Mocha, A Brew to Kill, and Holiday Buzz. Click on any of the images below to review these books in more detail on Amazon.com. What are your favorite holiday reads? What are your favorite cozy mystery series? I'd love to hear what you think - share your thoughts with us in the comments section below!